Marcus Holloway is a good kid. Through circumstances out of his control, he was pegged by ctOS's predictive crime algorithm as the likely suspect in crimes he was in no way responsible for. Though scarred by this incident, and left with a certain rage against the machine, he has never once lost his glib charisma and sense of morality. Armed with naught but a Stun Gun and a billiard ball attached to a rope, Marcus is on a mission not to punish, not to kill, but to expose. Rather than blindly take his anger out on others, like a certain someone before him, he seeks to show people the faults and risks with relying on surveillance technologies to keep the streets safe. I am Marcus Holloway, and this is the lens from which I view the world. These were my thoughts as I played through the majority of Watch_Dogs 2. Unlike Aiden Pearce, I quickly took to Marcus Holloway. He's a genuinely endearing protagonist with charisma to spare and a strong supporting cast behind him all the way. And beneath all that charm, I sensed a soul to him that I just never could when playing the original Watch_Dogs. For this reason, I endeavored to be as non-lethal as I possibly could during my time in Watch_Dogs 2. Instead of detonating gas pipes and exploding transformers to murder those that stood between me and my objectives, I opted for more elegant solutions. I look for electric panels to shock my adversaries unconscious for a few minutes. I chose to utilize my Stun Gun rather than purchase other, more effective weaponry. And, whenever possible, I would sneak around guards without fighting them at all by using distractions, drones, and good old fashioned positioning. This was my interpretation of Marcus. Watching him hang out with his friends, encourage them in the face of doubt or adversity, expose the crimes of the elite, I got the impression that Marcus was someone out to do the right thing. Despite his backstory, Marcus never talked of taking revenge on Blume, who produces and controls ctOS. He's not out to murder the people responsible and take revenge. Not even close. The reason he joined DedSec was to ensure ctOS can't do what it did to him to anyone else. Not by killing, but by exposing the dangers to the public at large. About halfway through the game's story, one of Marcus's, and by extension my, DedSec friends named Horatio was kidnapped by the Tezcans gang. 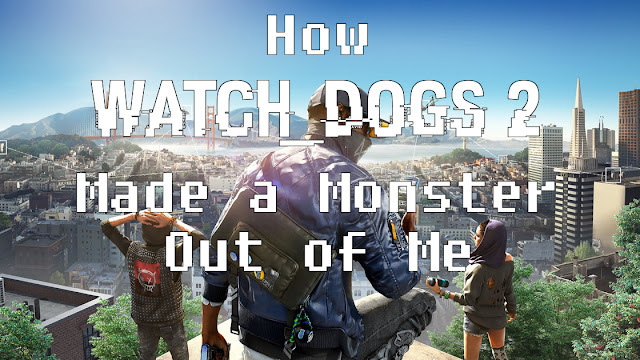 Several missions ago, Horatio helped me out by sneaking me into Nudle (the Watch_Dogs 2 equivalent of Google), risking his job in order to help me and the rest of my team find information linking them to ctOS. When his bosses suspected him of being a spy, we hacked into the systems in order to bail him out. As our friend and associate, I, Marcus, and the rest of DedSec came together to find him and bring him back. By the time we found him, it was too late. Together, we grieved. Our focus shifted. What was previously a mission to rescue our friend became a quest to send the Tezcans a message that this will not be tolerated. As a unit, my DedSec allies, Marcus, and I worked to located the gang members who performed the deed. Luckily for us, we succeeded. The three of them just so happened to be gathering in the same place. Earlier, I had acquired two unique hacks. Using my backdoor into the ctOS platform, I could implant a false APB on an individual of my choosing, forcing the police to respond. Likewise, I could instead opt to create evidence that they betrayed one of San Francisco's gangs, summon that gang and starting a shootout on the spot. I had never intended to use these powers. At the time, they were little more than checkboxes on a completionist’s list. Marcus had fallen victim to something very similar. It would be disrespectful to him if I forced him to use those same tools against others. So even though my friend had been killed, I had still endeavored to remain non-lethal and avoid resorting to such shameful tactics. I wanted to stay true to the Marcus Holloway in my head. My mission was not to kill these 3 gang members, it was merely to 'neutralize' them. It would have been enough to knock them out and send a message to their superiors. After numerous attempts and failures, an insidious thought crossed my mind. Why should I spare these three? When Horatio wanted nothing more than to be left alone, these three kidnapped him, forced him to work for them, then murdered him in cold-blood when he refused. Why should these three and their friends live when my friend can't? With that in mind, I did the unthinkable. I took out my Quadcopter drone, found one of them, and implanted an APB into ctOS to summon the police for a shootout. As officers arrived on scene, I tricked another gang into joining the fray by making ctOS think another one of my three targets was a traitor. In one fell swoop, I had created a three-way war between 2 rival gangs and the cops. I felt nothing for any of these people. At first, I justified it by saying that these monsters had already made enemies of the police by becoming the ruthless criminals they are. I told myself that the police knew what they signed up for, and that for these reasons any deaths were justified. And although I had never once fired a shot, I sat and watched as all 3 groups fought and slaughtered each other. In the end, a single police officer was left standing. My enemies were indeed 'neutralized'. Later, we were ready to move onto the leader of the Tezcans, in order to send him a message for ordering the kidnapping. In the same manner as I took care of his goons, I sent a gang after him as well. The difference was the instead of merely watching, I waited for my opportunity to take advantage of the chaos. I found it when he walked towards one of the cages housing a bulldog bred to fight others of his kin in the ring, to the death. I remotely opened the beast's cage, and let him loose on his master. Like his cronies before him, I had 'neutralized' the gang leader. If only it stopped there. Once I had seen how easy it was to send police and gangs after my enemies with the push of a button, it quickly became a go-to tactic for dispensing with large groups of enemies without putting Marcus's neck on the line. Gang members defending a stash of money, police officers patrolling around a ctOS box I needed to hack, or even rent-a-cops in an office building: None of them were safe. I was no longer Marcus Holloway. Marcus still believed it was possible to complete his goals without violence. Through my objective notifications, Marcus told me that I only needed to sneak in, perform a few hacks, and get out. It was his voice telling me that I only needed to “neutralize” the people I came across, if I even needed to confront them at all. He still hung out with his friends, trying to expose Blume and their associates without stooping to that same level, but why bother? It was just so much easier to have a couple of no name mobsters blow everyone away and complete my mission once the dust settles. Marcus knew what it's like to have a computer algorithm call him a criminal and send a bunch of police after him. He knew what it could do to people, but I didn't care. What a monster I had become.